What do you do when it is the middle of the night and no one is on site and your data room AC unit shuts down and now your servers start to over heat ? Will you be notified that there is a problem so that personnel can be dispatched to the site to get the AC units back on line before the data room equipment overheats and shuts down? Some companies have large building monitoring systems that monitor all of their AC units, power and fire alarms systems. These building monitoring systems can page and email staff when problems occur and show graphic one lines of the building systems. But for a small company it is hard to justify the cost of a large building monitor system when they only need to monitor a couple points form the Data room. Sensaphones products fill this need for a small monitoring package that depending on the product can page or send out Email notices. Two of the most popular products of the Sensaphone line is the 400 and 800 auto dialers. These units feature either 4 or 8 dry contacts/temperature input and the ability to dial either 4 or 8 telephone numbers. So for a small data room the unit can be setup to monitor a humidity alarm, the AC unit, Temperature alarm and even the UPS power. When the unit detects any one of the alarm conditions it will make a voice call to programed telephone numbers and the user can get a status of the alarm condition and acknowledge the alarm. For a very small price the smaller data room can have monitoring capabilities and give the data room manager a higher comfort level with their facility. The Sensaphone 400 and 800 are used by many customers for monitoring their cabins or rental property. The owner will get call when there is a problem and can respond before costly property damage occurs, like when the heat fails in the winter and the pipes freeze and burst. Sensaphone has a complete line of monitoring equipment for a variety of needs. Power Systems Specialists, Inc. sells and installs the Phonetics, Inc. Sensaphone® line of site monitors. With over 150,000 users worldwide, Sensaphone® is the perfect choice for your site monitoring needs. For small businesses, property owners, and more, the ALL NEW Sensaphone 400 offers an easy, inexpensive way to monitor a remote facility. It can be installed in any clean indoor environment to monitor a variety of applications. • Direct replacement for the model 1104 • Four user defined telephone numbers • Makes voice phone calls with customized messages • Built-in alarm test function to simulate and test the notification process • Includes telephone Line Seizure Read more…. When you need to monitor additional conditions, or need to notify more people, the 800 is the best choice. It has all of the same features as the 400, but instead of four external inputs, it is equipped with eight. And instead of being able to notify four people, it can notify eight using the same custom voice phone call technology. And like the 400, one of the external inputs comes with a local temperature sensor installed. • Direct replacement for the model 1108 • Eight user defined telephone numbers • Makes voice phone calls with customized messages • Built-in alarm test function to simulate and test the notification process • Includes telephone Line Seizure Read more…. The Sensaphone 1400 provides a significant step up over the 400. While performing all of the functions of the 400, the 1400 comes in a sealed, weatherproof, lockable enclosure, making it suitable for harsh or corrosive environments. • Ultra-low freezer monitoring all the way down to -85° C • Sealed weatherproof enclosure • 8 numbers, select custom voice or numeric pager • 4 inputs: select temperature, dry contact, or 4-0mA analog • • Includes telephone Line Seizure Read more…. Now you can monitor critical conditions at remote locations without running wires. Introducing the new Sensaphone 2800 with Wireless Sensor Technology. Based on proven Sensaphone remote monitoring methods, the 2800 adds the ability to read sensor status from wireless sensors. And not just simple on/off status, or open/closed conditions. The Sensaphone Wireless Technology includes full analog capability so real world values can be monitored, like actual temperatures, real tank levels and flow rates. • Ultra-low freezer monitoring all the way down to -85° C • Sealed weatherproof enclosure • 8 numbers, select custom voice or numeric pager • 4 wireless and 4 hard-wired inputs • 1 Relay (manual or automatic control) • Includes telephone Line Seizure Read more…. Our G8000 UPS is widely used in the medical industry where power protection is critical. The G8000 offers unity power factor output which provides 20% more power than other UPS manufacturers. It is also 100% generator compatible, and its low input current harmonics means that you do not need to oversize your generator! In addition, the G8000's high crest factor is perfect to use on medical equipment such as MRIs and CT Scanners which have a high current inrush. Read more…. The Sensaphone 1800 provides a significant step up over the 800. While performing all of the functions of the 400, the 1400 comes in a sealed, weatherproof, lockable enclosure, making it suitable for harsh or corrosive environments. • Ultra-low freezer monitoring all the way down to -85° C • Sealed weatherproof enclosure • 8 numbers, select custom voice or numeric pager • 8 inputs: select temperature, dry contact, or 4-0mA analog • 1 Relay (manual or automatic control) • Includes telephone Line Seizure Read more…. SCADA 3000: The fully integrated control system. With the SCADA 3000, the high cost of control is history! 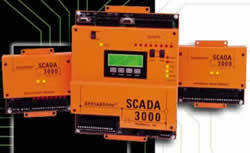 SCADA 3000 provides everything you need--from software to modules--in one comprehensive package. Read more…. SCADA 3000: The fully integrated control system. With the SCADA 3000, the high cost of control is history! SCADA 3000 provides everything you need-- from software to modules--in one comprehensive package. Read more….